The Gents Blog Taun: Dental Floss for Your Face? Taun: Dental Floss for Your Face? Men out there seem to have a stigma attached to anti-aging creams and serums and any other product that seemingly might take away from their manhood. However, this is one stigma that should be broken. Now instead of going to the mall and settling for an anti-aging product made primary for women you can get your own. Taun Small Batch Men’s Skin Care was made by two men, for men. It is a proven fact that men and women DO NOT share the same skin composition. In fact, the only area on the face that is the same for men and women alike is right under the eye. So why not use a product made for YOUR skin, tested and proven to show results? Taun’s Facial Repair Formula is first and foremost designed to fight the signs of aging and second to act as a moisturizer. Taun was also created to double as an eye cream. The under eye area is the thinnest skin on the face, thus this area tends to show aging first. It is crucial to regularly use a product that will slow down this process. Taun consists of 13 scientifically proven ingredients that have been developed into one product. Literally everything your face needs can be found in this one jar. It contains the most proven anti-aging over-the-counter topical ingredient sold on the market; Retinol. The foundation of any anti-aging routine must contain that one ingredient. I won’t bore you with the other 12 ingredients: just trust me that each one was thoughtfully chosen to deliver a specific result. 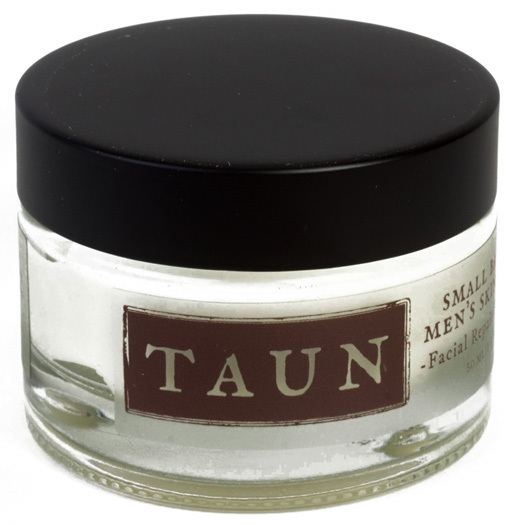 Taun contains no fragrance, no dyes, and is never tested on animals. Men of any age and skin type can benefit from the ingredients found in the Facial Repair Formula whether they want to diminish current issues or delay future concerns. Think of the Facial Repair Formula like dental floss for your face! Thanks for the post Gents Place! We’re excited to be featured in TGP and to start exposing some reluctant men to some helpful ingredients. We recently were written up on Electrogent who is doing a longterm trial of the product. Pictures can always be misleading so we take that with a grain of salt but he seems genuinely impressed by the results which is the important part. Check it out here (http://www.electrogent.com/2013/04/the-two-taun-test-week-four/) then head to TGP store to get your own. Do you tell this product at your stores? Yes, we sell it in all three of our clubs as well as online.